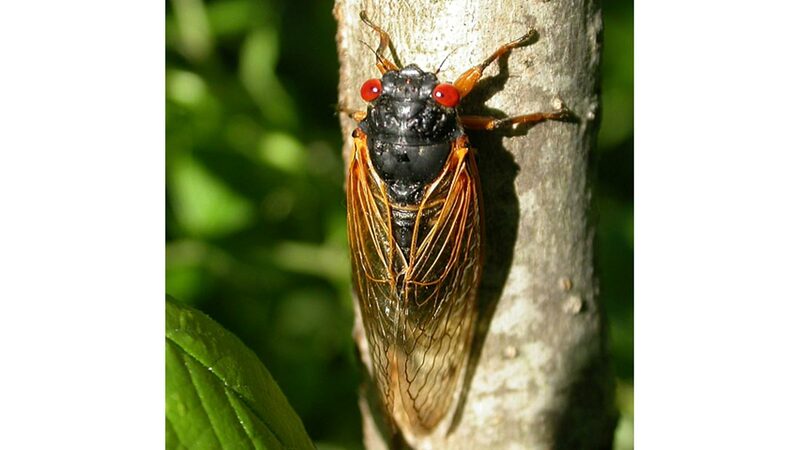 The Cooperative Institute for Climate and Satellites – North Carolina, CICS-NC, helps predict the 17-year cicadas’ arrival in a national citizen-science project led by National Public Radio’s Radiolab. A large brood of 17-year cicadas is expected to emerge this spring across portions of eastern North America including Connecticut, Maryland, New Jersey, New York, North Carolina, Pennsylvania and Virginia. The presence of the cicadas can easily be identified by their mating song, one of the loudest sounds known to be produced by insects. The periodical cicadas returning this year, known as the Magicicada Brood II, are expected to emerge once soil temperatures at about 8 inches (20 centimeters) in depth warms to about 64 °F (17°C). If you live in these areas, you can help track the emergence via a citizen-science project developed by the National Public Radio Radiolab program. Radiolab is inviting the public to place homemade temperature sensors in the ground and report their findings. To help understand local variability with a reliable reference for these soil temperature measurements, Dr. Jesse Bell and Mr. Jim Biard, of the Cooperative Institute for Climate and Satellites – NC, contacted Radiolab and provided them with information about how to access soil temperatures from the U.S. Climate Reference Network (USCRN). The USCRN is a set of climate-monitoring stations maintained and operated by the NOAA National Centers for Environmental Information (NCEI). These stations are located all over the USA, and provide climate-science-quality measurements of a number of quantities, including air temperature, precipitation, humidity, soil temperature, and soil moisture. There are 10 USCRN stations in the general region covered by Brood II that measure soil temperature at 8 inches depth. These highly accurate and reliable soil temperature measurements help the Radiolab project by providing a reference to compare the other reports with, and temperatures from a number of stations are now visible on their temperature report map.